Last night I had the distinct pleasure of being invited to the opening of one of my favorite places- a wine store! 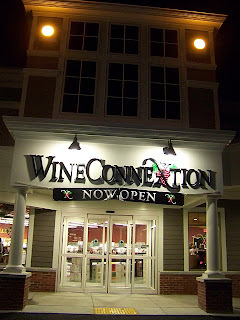 Wine ConneXtion at 117 Main Street, North Andover has just recently opened with one hot new concept in wine sales- setting up a tasting area for the consumer, and selling at a discount! Director/Owner Sam Messina has realized that that purchasing good wine shouldn't have to be in place of a mortgage, and so, since he saves by buying in bulk- he thought he'd pass along the savings to his customers. Nice of him huh? Well-he's just a nice guy! Sam isn't "just" a nice guy though- he's also incredibly knowledgeable. In speaking with him he can share unbelievable amounts of information on regional wines, be it California based, Italian or French. And he is more than willing to share. 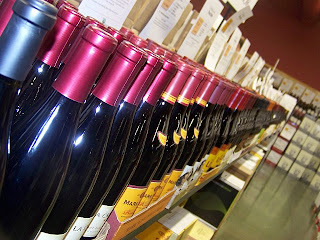 After speaking with Sam, and enjoying a glass or two of their delicious wines, I set out exploring the store. My favorite things? Informational signs for every bottle of wine clearly stating its unique characteristics, as well as drinkability and preferred food pairings. All too often you're left standing in a wine store, bottle in hand, wondering if it really will go with that beautiful piece of salmon that you're grilling, or if it will pair with roasted chicken better. And then there are those times that you receive a lovely bottle of wine as a gift, and then you wonder if its a "drink now" or a "wait a few years and it will get even better"- Wine ConneXtion has solved that problem for us. Finally, my last favorite thing, which by far not least, is their prices. We are talking serious discounts here! 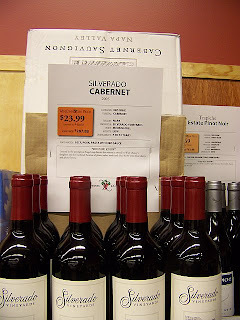 One of the fellow bloggers I met there called them "Trader Joe wine prices" and she was so very right! My favorite vineyard, as I've mentioned before, is the Silverado out of California. The only problem with it, is it is just too highly priced to be a practical frequently drunk wine. But at Wine ConneXtion prices-well I just had to scoop up a bottle. Sam was very tempting in his offer to purchase a case of my preferred variety and pass it along to me at the same great discounted rates. I might be in love. Overall, Wine ConneXtion is one heck of a great place. It is a bit of a drive from Boston, but for prices and selection and some great quality wines, I think its more than worth the trip! Thanks to everyone at Wine ConneXtion, and Kory and all at Pan Communications for a great evening!